So it’s been roughly 2 years since I took the step from kit beers to my all grain setup. That is a total of 19 brewdays and 95 gallons of beer produced, which resulted in me filling nearly 800 bottles! Over the course I’d noticed a few glitches in my setup: the hop filter in the boiler was too long so the cooler didn’t fully fit in, when making a beer over 5% Abv the mashtun was often full to the brim and spillages happened quite regularly and the gravity fed setup took up too much room in the garage and didn’t have the space to store all the other equipment! The time had come for an upgrade! 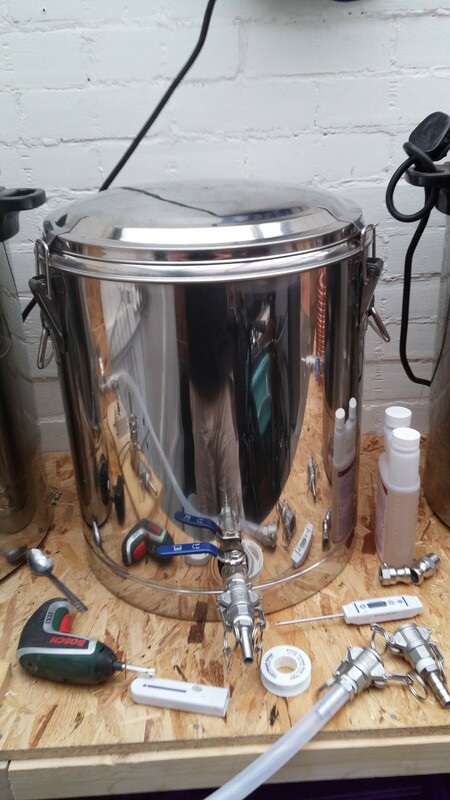 This being the case I’d limit my own upgrades to a new mashtun and other additions to make the brewday easier or slightly enhanced in some way! First upgrade was a new brewing bench. My fledgling wood working skills lucked out again and now there is a dedicated corner for brewing and the storage of brewing stuff! The walls and doors are painted with a moisture resistant paint that claims to be self-cleaning… well it’s worth a try isn’t it?! The eagle eyed will notice this is all on one level now so gravity isn’t going to help me anymore! Second up was the mashtun; this would change from a 30l blue plastic cool box affair to a 38.5l stainless steel thermopot. It would have just enough extra volume to allow me to fit those higher ABV beers, and it would also have a false bottom for ease when sparging and cleaning afterwards. The thermopots insulation will help ensure that my mash temperatures remain steady over the full 90 minute mash. Upgrade number three: pumps and hoses! The pump (just hidden behind the curve in the hose) is a 24v solar pump controlled with a dimmer switch unit. 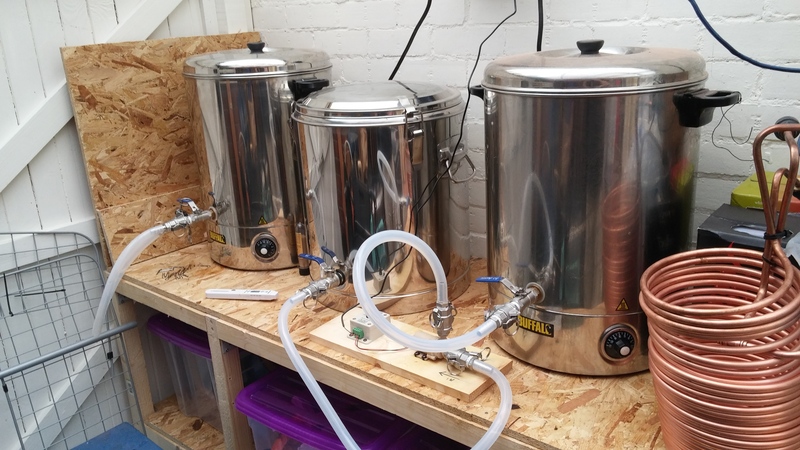 Not the most powerful option available to homebrewers but plenty strong enough to move the wort from the mash tun to the boiler on the right. The new hoses are reinforced silicon and are with stainless steel Camlok quick fittings. Finally, as a little extra toy I also made a hopback but I will cover that in more detail in a separate post!